How do I send unsubscribes to my store? Learn what 2-Way Unsubscribe is and how to enable/disable it. 2-Way Unsubscribe is a feature that when enabled means that unsubscribes on your SmartrMail will flow through to your Shopify or Neto account. This means that when someone unsubscribes through SmartrMail, they will also be taken off your mailing list within Neto or Shopify. You can enable/disable this feature by clicking on your account name in the top right of your screen, then selecting Setting in the drop down menu. On the settings page, you then click on the 'Subscribers' tab to find the 2-Way Unsubscribe option. Note: This feature is only available for Neto and Shopify stores. 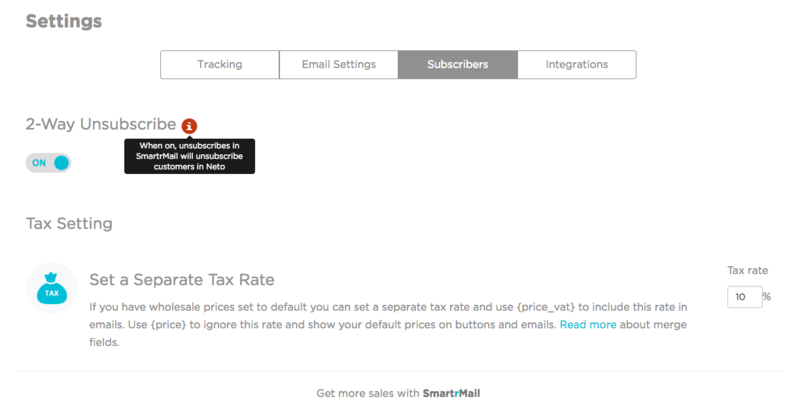 Also: Should a customer unsubscribe from your ecommerce store outside of SmartrMail, they will always be automatically unsubscribed within SmartrMail too. This applies to all SmartrMail accounts, not just Neto and Shopify stores.